The Allen and Young Removals Company based in North West London and are pleased to be able to offer the full range of our Removals, Packing, Man and Van Hire, Storage, House Clearance and a range of Business Moving Services to all West London Districts and all of the following postcodes: W1, W2, W3, W4, W5, W6, W7, W8, W9, W10, W11, W12, W13 and W14. Allen and Young are an independent professional removals company and we carry out all moving and relocation services throughout West London. We also offer storage to our West London clients, with our storage facilities located conveniently on the A406 North Circular Road. We can easily come out to your home to do a personal survey so we can establish your exact requirements for your removal. Feel free to browse our website or call us for a free no quotation without any obligation today. West London is the area of Greater London to the west of Central London. Although it is only ambiguously defined, it is one of the most economically active areas of London outside of the centre, containing significant amounts of office space along with Heathrow Airport and many of its associated businesses. Allen and Young Ltd carry out all our services including removals in West London and also packing, storage and shipping as well. Definitions of this area are generally unofficial and can vary considerably, but generally include districts around the M4 motorway corridor. 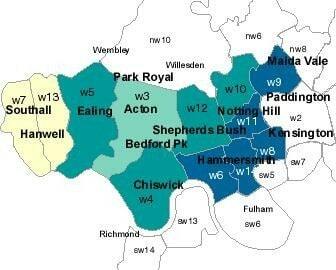 The inner London boroughs of the Royal Borough of Kensington and Chelsea and Hammersmith & Fulham and the outer London boroughs of Ealing, Hounslow and Hillingdon are most commonly associated with West London. For strategic purposes such as planning, the more northerly boroughs of Brent and Harrow may also be included, although in everyday usage they would probably be considered either as part of North London or as a distinct sector, North West London. London planning documents such as the London Plan refer to a strategic area called the “Western Wedge”, which is intended to include West London and the Thames Valley beyond. The Western Wedge is considered to begin around Paddington and to fan along the M4/A4, A40/M40 and A316/M3 routes. West London is close to the River Thames and is therefore generally flat, except at its northern edges. As with most parts of London, it is punctuated by numerous local centres of varying sizes, which evolved from older towns and villages connected to London by new railways before becoming absorbed by the expanding urban area such as Shepherd’s Bush, now a local centre in West London. Close to central London is the traditionally fashionable and expensive residential area of Notting Hill, made better known in 1999 by a film of the same name starring Hugh Grant and Julia Roberts. The Notting Hill Carnival is an annual event here led by members of the Caribbean community, many of whom have lived in the area since the 1950s. The carnival attracts up to 1.5 million people, making it the largest street festival in Europe. Also within the area is the famous antique market at Portobello Road. Allen and Young are often move antiques to and from the Portobello Road Area.